Developing an App is an exciting process. You design it, code it, and submit it. Now it’s sitting in the a few app stores gathering downloads, getting featured… but do you have a leaky bucket? Are you losing the users you’ve just acquired? The BAD NEWS for Apps is that 80-90% are deleted within a year, according to a Compuware study. In fact, 22% of Apps are used only once. What this really means is that people have downloaded hundreds of Apps, but only a small handful are actually used! Why does this happen? What is blocking your App’s potential? Let’s take a closer look. It’s not just about convincing the user to commit their time. Your App must jump to the top of their mind when they make that split second decision. Think about a personal example. Like me, you probably have an App that you just can’t form a habit around. Mine is with Evernote. Even though people would rave about it, I just couldn’t switch from Google Tasks – Google Tasks was my habit. If we re-examine the retention curve, there is actually a surprise at the end. This chart (from a study by Localytics) shows there is a usage chasm and then a large percentage of apps that have much better engagement (opened more than 11 times). 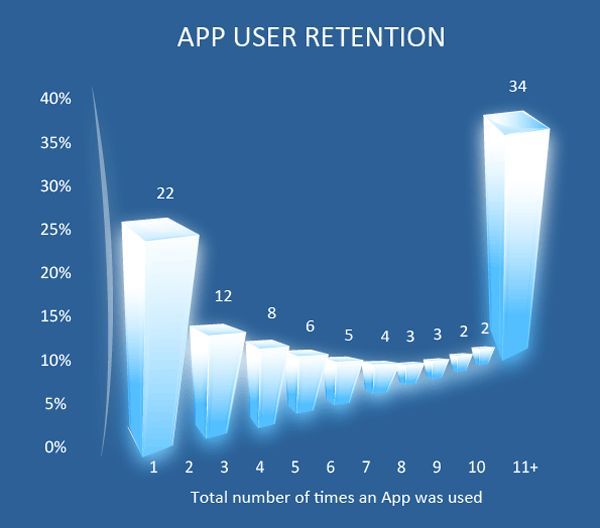 It really shows just how important it is to think about the long term engagement of your App. Habit works both ways. First you must overcome the usage chasm, but once your App is the habit, using it becomes natural. This then provides natural protection against incoming competitors. can be applied to Apps. Strategies like these are almost by nature built into social messaging Apps. This is part of the reason Facebook and WhatsApp can have up to 70% of their users active on any given day. Not all users are engaged in the same way. How strong their habit is at the moment affects the next stage you want to get them to. The easiest way to characterize habit formation is by tracking Frequency and Recency. Users with a high frequency of sessions are likely to be power users. In contrast, users with low session counts needs to be encouraged to take full advantage of the App. Users with an early spike and decreasing use are likely finding it difficult to disrupt their previous patterns. A user that installed your App in the past 30 days but have not opened it in the last 7 days may be tipping on a critical point of no return. If they don’t rediscover your App soon, they may forget about it and ignore it in the future. StreetHawk’s matching engine ensures your campaigns are highly targeted with the right notifications at the right time. Campaigns might include a second onboarding process, special offers or tips or geofence triggers for physical locations. Start thinking now about a communication plan with triggers that support the formation of your users’ habit. For more information on StreetHawk email david@streethawk.com or drop them a tweet at @StreetHawkApp and check out their site at http://streethawk.com.